Yesterday was the official start of the National Writing Project Annual Meeting, with long sessions in the morning and shorter ones in the afternoon. Many of the workshops were centered on developing and supporting the work at our writing project sites. I attended an always-interesting session called Writing in the Digital Age: Learning Environments and Student Writing (which I led a few years ago myself). Here, four different teachers presented various pieces of student work — podcasting, video storytelling, voicethreaded poems, and blogging connections. We broke off into smaller groups to examine the work and have a discussion around what we saw and what we could take out of it. Later that day, I ventured into a workshop called 21st Century Literacy and the Graphic Novel. This was a fascinating look at how the use of comics and graphic novels can open the doors for some of our students. Presenters Bee Foster and Anastasia Betts gave us a lot to think about. Bee, in particular, did a fantastic job of showing us examples she uses in her classroom to support the deBois’ theme of “twoness” in character and adversity, race and self. This is the keynote address by Danielle Nicole DeVoss that got us thinking and then moving yesterday at the National Writing Project’s Digital Is Conference. It was a pretty amazing day here in Philly with the National Writing Project’s Digital Is Conference — we spent the entire day discussing, debating and considering the emerging digital literacy movement that we are seeing reflected in the lives of our children and students. The morning began with an overview of why we were here — the rationale behind talking about the influx of digital media in our classrooms and why it is part of the writing focus. We then broke off into smaller groups. I took part in a discussion called Change Writers, which focused on a project that connected eighth graders with fourth graders in California to research social injustice, discuss the issues via blogs and then move into positive social action as a result. Much of our talk focused in on what the students did, with the teacher putting on emphasis on the fact that it was not the technological tools, but the ways those tools were used. In this case, the technology of blogs and voicethreads opened up a large audience for students who are often left out of the conversation because of socio-economic issues. “The technology is a piece of it. But it is not all about technology … Technology allowed us to take down the walls of the classroom. They were not just writing for me. They were writing for peers, for others, and getting feedback. The got to write without that ‘red pen’ slashing through everything. They could have conversations.” — Lesley McKillop, Prairie Elementary School. “It’s not about the technology. It’s about using technology to help students join communities. They were no longer confined (to their classroom).” — Gail Desler, Area 3 Writing Project. Later, I presented some student digital work — a digital science picture book — to a group and due to our protocols for discussion, I had to sit silently while the room talked about what they saw in the project, what “worked,” and what questions they had. Only then could I, the presenting teacher, grab the floor and put the project into context. It was a bit nerve-wracking, particularly when I saw former NWP Executive Director Richard Sterling sitting right in front of me with colleagues Charlie Moran and Anne Herrington. And across the room was Gail Hawisher. These folks are HUGE in the land of composition. But it was intriguing to “experience” the book through their eyes and lens. A second afternoon session brought different folks together to talk about what they had learned and observed after viewing difference pieces of student work. I took a bunch of notes, but they would not make much sense to anyone (not even me at this point). But this Wordle nicely captures the main ideas from our discussion, which focused a lot on what we view as the new definition of Writing (not everyone agrees that this is new). • How do adults tackle issues affecting young people that the adults have not experienced themselves? • What is relationship between traditional forms of writing and the new forms of writing? • Keep an eye on the haves and have-nots – Will it exasperate the difference or equalize it? • What is “writing” these days? • What is missing from our conversations around digital literacy: questions about rhetoric and how it works and what you need to do it well. • Are traditional composition classes the training ground for the new media literacy? 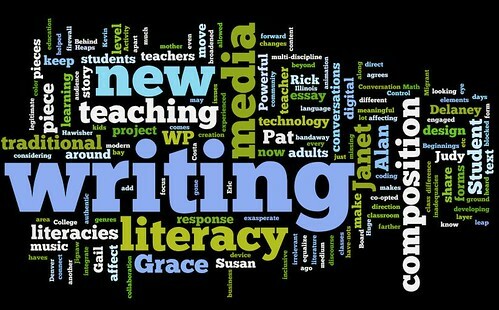 • Are new genres developing within new literacies that are irrelevant to the traditional writing classroom? • How does the new design – non-linear text and media – affect our views of literacy? • Do we even know what we should be teaching when it comes to new literacies? • How does firewall affect teaching new literacies if every step in any direction is blocked? • Some teachers are learning along with their students – they are learning by doing it. Finally, I attended a session down the street at the Museum of Natural History, where various kiosks of student digital work — podcasts, movies, digital stories, etc. — were on display for viewing, and then I attended an interesting forum discussion about how young people are using digital media in their lives and how are educators meeting this shift (Mostly, we are not, to be honest). So, long day with a lot to think about and ponder. It will be an exciting day today. I can tell. I’ll be participating in the Digital Is Conference here in Philly. The Digital Is Project is a new partnership between the National Writing Project and the MacArthur Foundation to explore how students are using digital tools for writing and learning. One of the larger projects still underway is an online site that documents what teachers are doing to scaffold use of digital tools in writing. A session I am attending this morning is called “Change Writers: Empowering Students to Write for Change.” If that doesn’t pique your interest, then you must not be a teacher wanting your students to become active participants in the world around them. One of the facilitators is my friend, Gail Desler, and I can’t wait to hear what she and the other presenters will share out about their experiences of using digital media (podcast, etc.) to explore social action projects with their students. Later, I am presenting some student work at a roundtable discussion. My piece is a Digital Science Picture Book and there is an entire protocol for folks to examine the work and think about it as a piece of digital composition. It’s a little nerve-wracking, I guess, although there is no real reason to be nervous about it. They’re all friends, right? I’m sure the conversations will be interesting and give me some outside insight into what my students are doing when they compose with these tools. Tonight, I signed up to attend an event called The Power of Youth Voice: What Kids Learn When They Create With Digital Media. It is taking place over at The Academy of Natural Science and that, too, should provide a real interesting take on what is happening with students composing with various media, for various purposes, for a variety of audiences. Neat. It’s that time of year: the Annual Meeting of the National Writing Project. Next week, I’ll be heading off to Philadelphia to join my fellow colleagues in celebrating and exploring the art of teaching writing, and the art of writing, in a variety of sessions. My hope is to blog and tweet about my experience there, including the exciting Digital Is conference on Wednesday that comes from an incredible new partnership between the NWP and the MacArthur Foundation. The work, which I am part of, helps take a look at where writing is going in the digital age. We’re in the process of developing online resources but this conference will bring together a lot of people to look at, discuss and then consider the implications of digital composition. I am presenting a piece of student work — a digital science book. That same night, I am going to a a conference entitled: The Power of Youth Voice: What Kids Learn When They Create with Digital Media. I can’t wait for that! My only other presentation at NWP this year is on Friday, when I am joining a number of other people in roundtable discussions about how to use an online social networking site to discuss books. A friend and I are focusing on a section of the online site where we talk about graphic novels and comics. We even had an interesting online book talk about a graphic novel that was fascinating and a bit frustrating, and shows the possibilities and the drawbacks of an online discussion site. This workshop explores the evolving nature of writing and literacy today. Participants will examine students’ digital writing from a range of classrooms and consider the digital and physical environments that support such writing practices. Participants will have opportunities to discuss the implications of what they observe for their own classroom and writing project site work. This session will focus on the prevalence and permanence of the graphic novel. We’ll examine its integration of multiple literacies as well as its impact on youth culture, youth identity formation, and the development of students as readers and writers. Participants will examine the graphic novel as a format and as a specific mode of communication and written self-expression and will explore its potentialities in the classroom as a tool for fostering the developing literacy of diverse student populations. Through discussion, participants will develop rationales for the increased use of graphic novels in 21st century classrooms. This Reading the Research session examines a research report titled Living and Learning with New Media: Summary of Findings from the Digital Youth Project. Funded by the MacArthur Foundation as part of their digital media and learning initiative, this report emerges from a three-year study carried out by researchers who explored the ways that the interaction with and use of new media impact the lives and learning of youth today. Facilitators and participants will explore implications for their local writing project work and applications for local programming. Plus, all of the other fun stuff — like social gatherings, the big morning address to all NWP folks in attendance (a great way to see how many people are there at the conference), with guest speaker Billy Collins. (wow!) I wonder if I can get him to sponsor me with my 30Poems 30Days project. Ha! And, to top it off, I am hoping that we can gather up a bunch of folks from my Tech Friends networking site — where NWP technology liaisons like me come together online to chat, share and connect. We usually try to convene for a dinner and face time. I am off to Philly next week for a variety of events — including the National Writing Project Annual Meeting, a day-long conference called Digital Is that is the product of a partnership between NWP and the MacArthur Foundation, and the annual meeting of the National Conference of Teachers of English. I’ll try to write more about what I am going to be up to later, but on Saturday (11/21), I am going to be with my co-editors of our book Teaching the New Writing, pen in hand and ready to sign books. A book signing! Wow. This will be the first. And my handwriting stinks, so it will be a challenge for me. 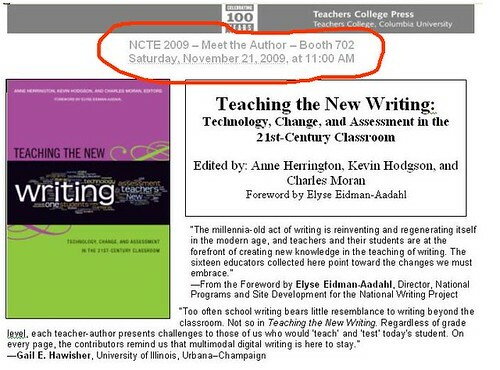 The book signing (at booth 702 at 11 am) comes right after a session that we (co-editors Charlie Moran and Anne Herrington and fellow chapter writer Dawn Reed) are doing for NCTE called Assigning and Assessing Multimedia Writing. We’ll be showing some student work (digital science books and podcasting work) and talking about ways to look at (or listen to) digital compositions from a teaching and assessment standpoint. That session takes place on Saturday at 9:30 a.m. at Marriott/Franklin 4, 4th Floor. How can we responsibly assign multimedia writing projects when state and national standards favor the five-paragraph theme? And what criteria can we use to assess this new writing in our own classrooms? This workshop will offer two models of multimedia projects, one a sixth grade digital picture book project and one a high school ‘This I Believe’ podcast project. The presenters will focus on the ways in which they hve assigned and scaffolded their students’ work in multimedia, the criteria they have used in assessing these multimedia projects, and the ways in which they have aligned the projects with state and national testing programs. Participants will then collaborate to develop assessment criteria for another multimedia text. At 1:15 that same day, I am one of the presenters at the Technology to Go kiosks and I will be showing people webcomics and hopefully, I will have a ToonDoo site ready for folks to get into and try out for themselves. So, if you are there, please say hello. I’ll start out by saying that the author of this fantastic new book — The Digital Writing Workshop — is Troy Hicks, a friend of mine through the National Writing Project and one of the chapter authors in my own book, Teaching the New Writing. So, this is not a completely unbiased recommendation to go out and get this book. But you should, particularly if you are interested in the ways that writing can use technology wisely with students in their role as composers with digital media. In this book, Troy lays out an entire realm of digital tools that are out there than can support and enhance the teaching of writing. He also touches on such ideas as Choice and Inquiry, Conferencing with students, publishing student work to a world audience, and assessing such digital work (always a tricky endeavor in my opinion). Troy grounds his work in the foundations of the Writing Process movement — where the focus is on the writer’s exploration — but examines the potential of technology for students. Wikis can be collaborative publishing spaces, collaborative word processors (like Google Docs) can show revision history, podcasting gives students a voice to the world, digital storytelling as a way to merge writing with image and more. Troy also provides plenty of information, such as his chart that shows the traits of effective and ineffective digital writers. He also wisely lays out the various technology and projects along a spectrum called MAPS: Mode, Media, Audience, Purpose, and Situation for the writer. 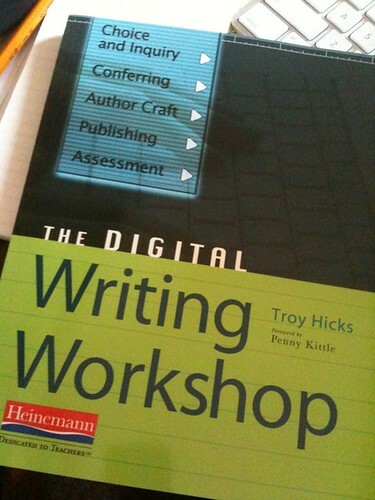 If you are a teacher interested in moving towards the digital writing world with your students, this is the book to get. Troy has made a useful and engaging book about the transformation going on in some classrooms, but not enough. I will be keeping this book on my desk at school and sharing it with colleagues when I can. You should, too. As some of you know, the way we celebrated National Day on Writing at our school was through the use of a large and expansive Comic Strip banner that asked the question: What do you like to write? I’m still trying to figure out what to do with the thing because it is huge. It’s also quite mesmerizing to look at. There are words and pictures and scribbles and notes and names all over the banner, every which way. It’s sort of a dizzying experience to read. Yesterday, before parent teacher conferences, I unrolled all of the parts and zoomed in on some areas with my camera. I mostly focused on the writing that answered the question posed originally. I then took those photos and put them into the Animoto video machine and this came out. I’m not happy with the music I chose, but it works for now, I guess. I hope it gives a flavor of the banner. 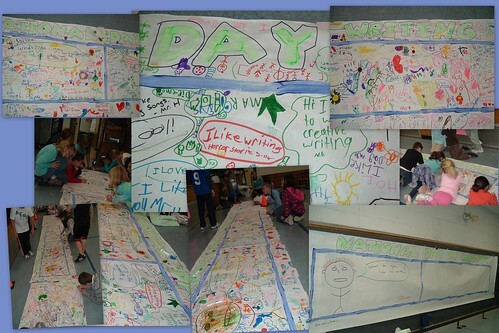 Well, the Huge Comic Strip Concept for celebrating at National Day on Writing at our school was pretty successful. It was also completely chaotic, as students rushed into the cafeteria at lunch, forgetting that they were there to eat and only wanted to write on the comic strip banner. At one point, I had to leave my own classroom just to act as traffic controller for the cafeteria staff, but it was fun to see so much energy and excitement around the act of writing and drawing. I started with one large comic strip banner, but quickly realized that it was filling up and three times, I had to rush out, cut another strip of banner paper and add it to the original. I would turn my head and when I looked back, that one, too, would be filled with writing. The original comic asked the question: What do you like to write? The answers ranged from stories, to poems, to plays, to comics, to tales about pets, sports stories and songs. It was pretty cool, and I had some great discussions with the younger kids about what they like to write. I hope you were able to celebrate your own version of the National Day on Writing, too.